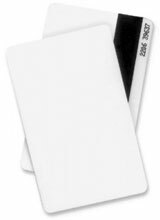 Brady PVC Cards - Red PVC Cards, with 1/2" Hico Magnetic Stripe, Cr80 30 Mil (750 Mic), Video Grade. Quantity of 500. ID cards for a secure facility. The Brady 1350-2061 is also known as Brady People ID	1350-2061	or 13502061	.